Wow! 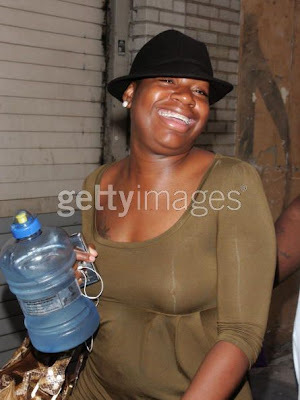 Fame has really agreed with Fantasia. She looks hot! Oh and that’s not one of those mini water bottles. That’s actually a full sized water bubbler. She’s just that big! Oh, and before you all send me hate mail (as you always do when I tee off on Fantasia) I know that she’s a talent, and stars in The Color Purple, and beats off Oprah, and that I’m just a loser blogger who is talentless and should go to hell blah blah blah. Save it. I already have all of your hate mail printed and hanging on my refrigerator. P.S and I know your IP address and I’m telling your boss. Best wishes. Who Shot That Mess, that Beautiful Mess!?! ?